Halloween carries a large sense of nostalgia for me in dressing up in my costume, running around my neighborhood after dark and receiving pounds of candy I wasn’t otherwise allowed as a young child. I love Halloween, yet as a family with special diet needs, this season can also be very challenging. I want to help my children enjoy this holiday while not always feeling like they go without. We have diet restrictions we can’t bend on, but I also know plenty of people who would like to have alternatives for corn syrup, sugar, and chemically colored food not only for their own kids, but for parties they throw, candy they hand out at their door, and for school parties where there are dietary restrictions to think about. I dedicate hours of my time to reading, researching and finding blogs, books and magazines around healthy food…so bookmark this page and save yourself the time! I don’t want to overwhelm you with all your options, so here are my top 3-5 ideas in a three categories! And if the idea of trying to create a healthier Halloween seems difficult to you, trust me, it is easier than you think! So many stores are offering healthier (read corn syrup and artificial food coloring free) options these days! Another benefit of making your candy, or purchasing organic and fair trade, is that you won’t have to worry about your money going towards the abuse or mistreatment of employees of the big candy manufacturers. What the stores don’t carry, there are many online resources where you can make purchases now, and have the candy and treats ready way before you need them for October 30th! First, if you are going to spend 1-2 hours making treats for your kids or office, make sure you make it fun for you too. At Gatherhaus, we firmly believe in simplicity and not adding more stuff to your plate. Though at first this may take a bit of extra time, it will over the years simplify and streamline your Halloween prep. However, we get that there is a bit of work involved with this…so be sure to put yourself in the right frame of mind and mood. I make myself a yummy coffee (mine currently has rumchata in it), put on good music, and open the windows to relish in the nice weather! Make sure you enjoy this process as well. It’s key. Chocolates: Enjoy Life Foods is a fantastic brand that is free of all the top allergens and white processed sugar! You can grab bags of this at many local grocery stores, co-ops (though more expensive) or online at Thrive Market. They are cheapest at Thrive, but you need a membership and shipping, so the cost most likely evens out. I find two bags lasts me from Halloween to Christmas. If you find them any cheaper than $4.50 grab a bunch and throw them in your freezer. I don’t want to spend a lot of time “making” candy, so I try to get creative and find the easiest solutions. Find a fun Halloween or autumn themed (BPA free) mold, and reuse it every year. Melt the chocolate, pour, put the mold in the freezer, and viola! Done! To add variety, I drop a pistachio in the bottom of each mold (the color green for goblins!) and add melted chocolate on top. Two easy candies, hardly any effort. Got popcorn? Drizzle some melted chocolate on top and throw it in a baggie. 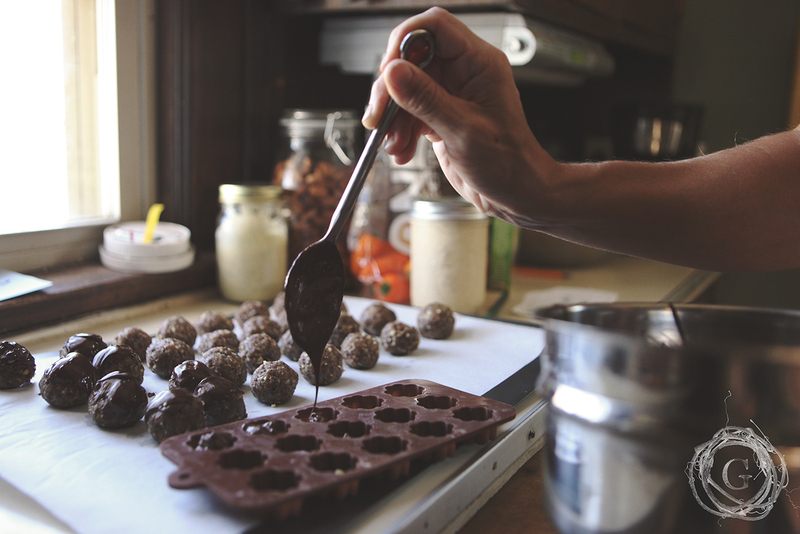 I love making protein cookie balls. (recipe at the end of blog). These are standard in our home as a snack, but I change it up a bit at Halloween and put chocolate on top and now it’s an extra special cookie! On Halloween, we all go trick or treating, and then when we are done, they trade out their buckets of candy they can’t eat, with a homemade decorated bag that they colored earlier with the treats they CAN eat. They understand this process, and we make it a special tradition so they don’t feel left out from the kids that get to gorge on endless traditional candy. By not giving our kids constant candies and desserts, but saving them for special occasions, the treats truly become special and anticipated every year. Their homemade bag will contain some or all of the items below…from applesauce, to a candy bar, to lollipops. Every family handles pounds of candy differently. For me, these are the treats for my kids lunches for the next two weeks. It serves as a double benefit for me! As far as the candy they received that they can’t eat, we donate it to the local Fire Station or troops overseas, or here is a blog that has lots more ideas! It’s hard to have special diet needs around Halloween, especially if friends want to have a party. One solution is to throw a party yourself and then you can be in charge of how low key it is. Make the games or activities the focus and not the food. 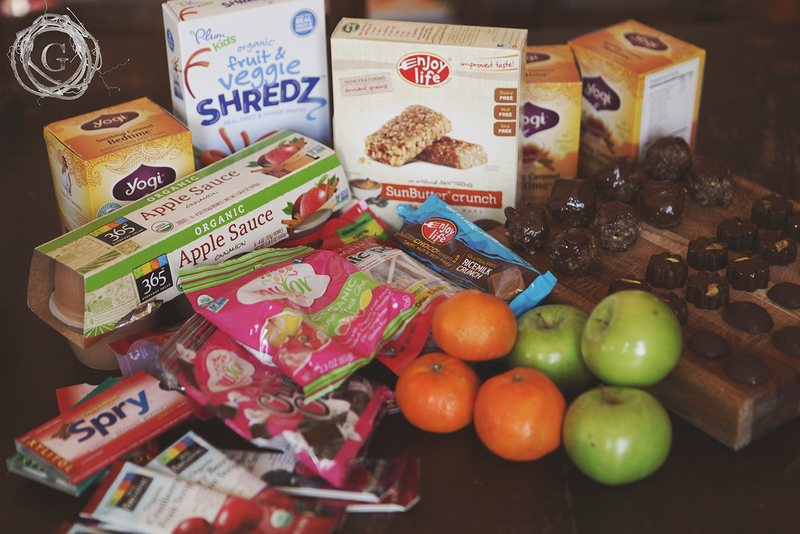 Pick hours that aren’t over a mealtime to help eliminate the need for lots of snacks. But what do you do about the food? 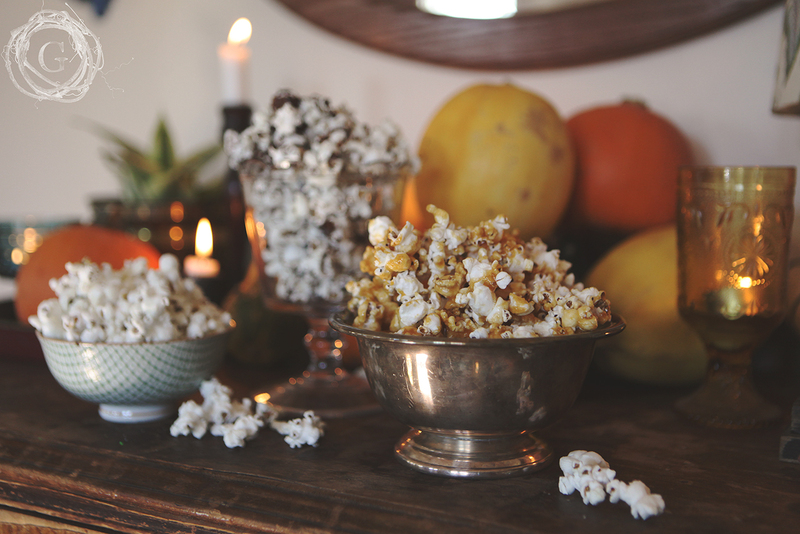 A popcorn buffet is a fun and really great way to celebrate the holiday. Pop a bunch of corn ahead of time in coconut oil for extra flavor. 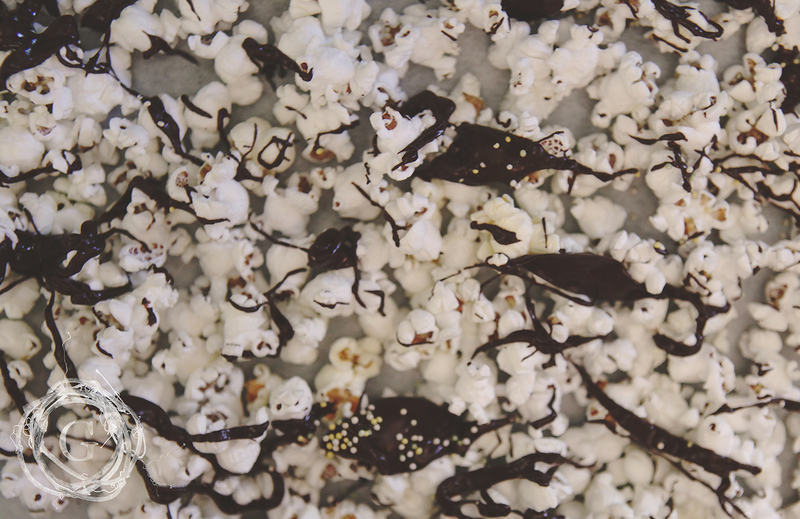 Leave some plain with sea salt, drizzle your Enjoy Life chocolate over another batch and make this honey based caramel corn! Of course you can also tie carrot sticks with twine for Harvest sticks, offer peppers stuffed with hummus, and apples dipped in caramel. Pinterest has no shortage of ideas, but the key truth to remember is that you want this to be fun and not take a lot of your time to create. You don’t need lots of ideas, just one. Want a good treat to hand out? You can’t go wrong with Yummy Earth Lollipops. Simple and easy, and you just have to buy them. The other mom’s will thank you as well. Feel like you want to make something special for the party? The Spunky Coconut and Chocolate Covered Katie have AMAZING ideas and recipes. These are my go to ladies when it comes to treats. I really don’t want to go overboard on Halloween, and yet, I do like to celebrate it. I make it easy on myself by doing the same things every year. It makes it simple, I know what to expect, how to make my treats and it becomes a fun tradition for my kids. Breakfast: They get apple cider. I only buy it once a year and this is the morning they get it. It feels special and they love it. I also make pumpkin pancakes (if I have time), otherwise pumpkin oatmeal. Just make a theme and get the color orange or green in there. Lunch: Sending my kids off to school where they are surrounded by treats and things they can’t have, I try to put my focus here on giving them something special. 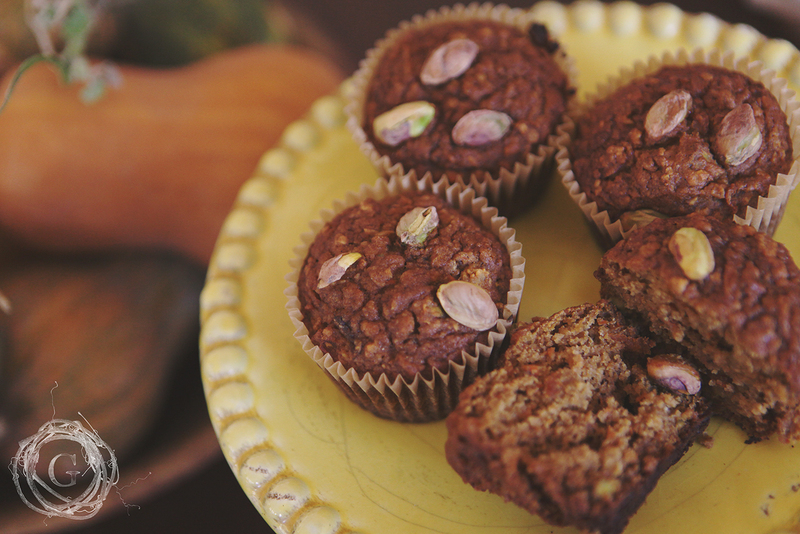 I make carrot and pistachio muffins, keeping with the color scheme, and call them Harvest Goblin Muffins. The original recipe is from Minimalist Baker. I LOVE this recipe and it is my go-to all the time. I just change up the ingredients to fit the occasion. My favorite is replacing the carrot with pumpkin. THE BEST! 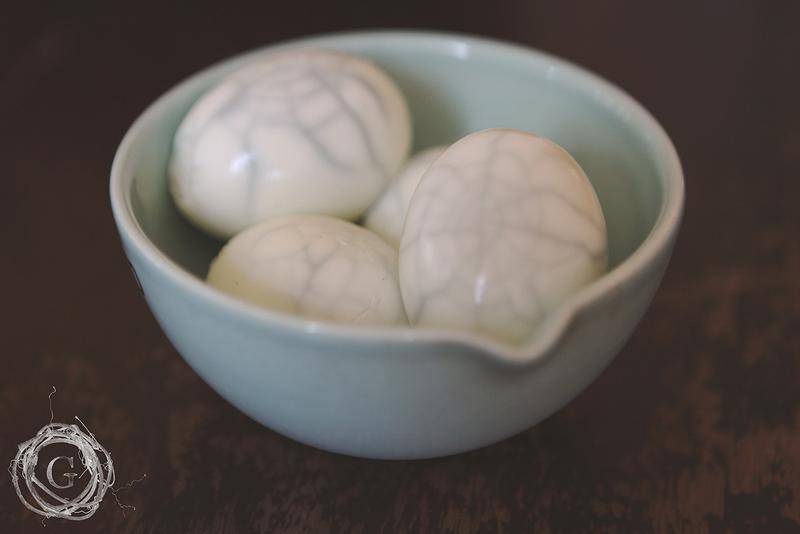 I also send along Spiderweb hardboiled eggs. Hard boil eggs as you normally would. Then when they are cool to the touch, give it a crack on the counter. Not enough to break the whole egg, but give it cracks in the shell. Then steep in a pan of hot water with blueberries for 15 min. (Never throw away the nasty blueberries in the pack. Throw them in a ziplock in your freezer for just this occasion. Then you don’t have to buy and waste new ones! It’s a no waste win win!) Peel away the cool egg shell and Viola! Spider eggs! My kids love these and it is a show stopper at school. Carrot sticks are easy and so is blueberry yogurt. Just think color and tie some twine around some veggies and it’s all of a sudden a fun harvest treat! A special fun lunch all done, and at little cost your time bank. 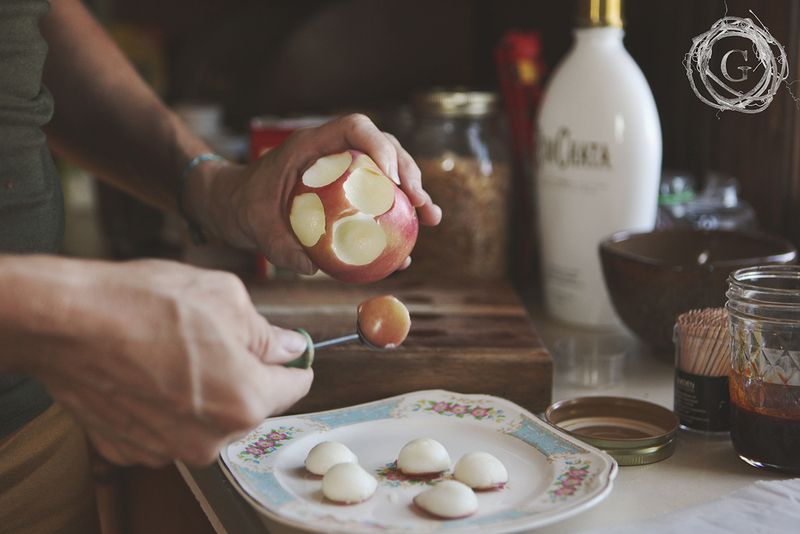 I love welcoming my kids home from school with small tiny apple dippers. 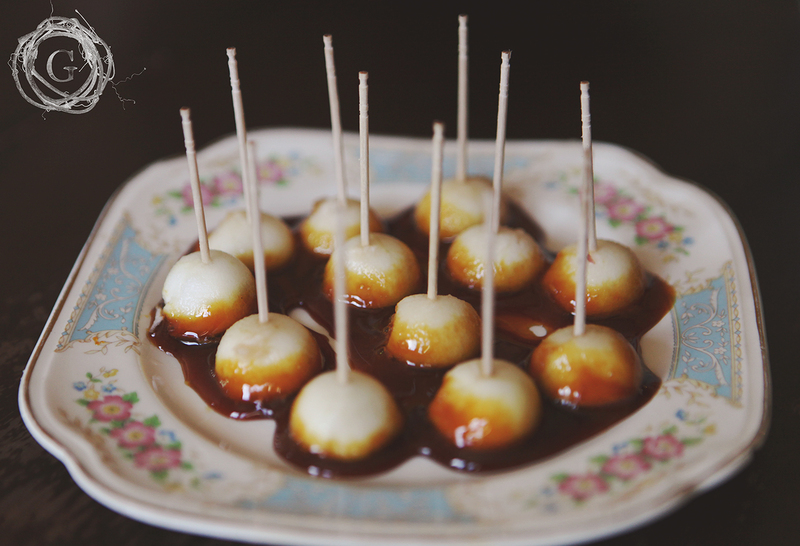 It’s a fun twist on the standard caramel apple. Kids love tiny and dipping, so it’s a winning treat and festive. I make my caramel with the recipe included at the end of this post. Dinner: Making chili warms us up before we go out for a cool night of trick or treating. The easiest way to make this dish festive is by using a cookie cutter with a bat or pumpkin design to cut a slice of cheese and putting that on top of the chili. I know there is lots of information here. Our goal here is to help condense all the information out there into tried and true tricks of Halloween. Remember the rule, pick ONE thing. I am not throwing a party this year. I can’t do it. The candy for Trick or Treating? Purchased early so it’s all done. Find what works for you. And if you have never had to venture into the allergy free world, it’s really tasty and you worry less about what you are putting in your kids’ bodies. Don’t get overwhelmed by you have to do, pick a thing and enjoy doing that. There are many other great treats out there, we didn’t list them all because too many options is too overwhelming. We may have already crossed that line. Thanks for sticking with us! Put all ingredients in food processor and blend till incorporated. If the mixture is dry, add more honey or nut butter 1 Tablespoon at a time. You want the finished product to hold together when you shape into balls. Once all the ingredients are incorporated and shaped into 1in balls, put in refrigerator to keep fresh. Cook honey for at least 10 minutes. You want the color to darken and the honey to thicken. Remove from heat and add in baking soda. It will bubble, but just keep stirring, it will become creamy. Stir for 5 min and then you are done!